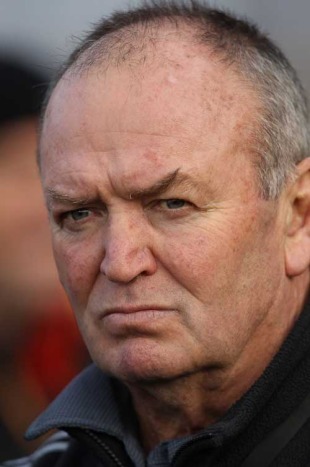 New Zealand coach Graham Henry expects Wales to raise their game in Hamilton next weekend after being humbled 42-9 by the All Blacks in Dunedin on Saturday. Wales produced a superb first half display and trailed just 15-9 going into the break in the last Test match staged at Carisbrook but they were unable to sustain that effort and were eventually swept aside by a clinical All Blacks side. Keven Mealamu was the first to cross the whitewash before Cory Jane added a second, although Wales felt Conrad Smith had snatched the ball after coming in at the side of the ruck to put his Hurricanes team-mate away. But it was the second half that showed the gulf in class between the two sides as Wales were unable to stay with the pace and intensity of the Daniel Carter-inspired All Blacks. The star fly-half put on a rugby master-class to scorch through a tiring defence for two tries to add to the four conversions and three penalties in his 27-point haul. Replacement back Richard Kahui scored a fifth try late in the game as Wales ran out of steam. But Henry, who coached Wales between 1998 and 2002, expects the visitors to hit back hard in the second and final Test in Hamilton on Saturday. "I think they've got a lot of pride, a lot of pride as a rugby nation," Henry said. "They will be hurting and when the Welsh dragon is hurt it usually breathes a bit of fire. I'd say they'd be right up for it." After New Zealand's 66-28 rout of 14-man Ireland, where they allowed the Irish in for four tries, Henry suggested that the new law interpretations meant that the days of teams conceding no tries were probably a thing of the past as teams profited from turnover ball. Yet Saturday's win was the third successive match the All Blacks have kept Wales try-less. "It was a good challenge for them (players) wasn't it?" Henry remarked. "The guys defended well and that was pleasing because it was a big step up from the week before. It makes a huge difference. Turnover ball is hard to defend against because they are disorganised so the more the better." New Zealand head to Hamilton with several injury concerns, the most serious of which are lock Anthony Boric (fractured cheekbone), Israel Dagg (concussion) and Conrad Smith (eye). Carter has a slight calf strain but Henry said it was "probable" his star pivot would line up at Waikato Stadium - the venue where he made his impressive debut in the record 55-3 win against Wales in 2003. There was less likelihood of either Boric or Dagg taking part though. "I think they will both struggle to play next week, particularly Israel who is not very well. You need time after those head knocks to make sure you're right. We wouldn't risk him," Henry said. "Boric has got a stress fracture in his cheekbone. He could probably play but I wonder whether it's worth that risk. Conrad Smith has got a poke in the eye and that's quite serious. So we just have to wait and see how that comes through in the next few days." Lock Tom Donnelly, who is on the comeback from an ankle injury, and fullback Mils Muliaina, who is returning from a calf strain, are expected to come into the mix. "Tom Donnelly played club football on Friday and he's ready to have a short run anyway at this level," the coach said. "He needs to play for some period of the game and I'm sure Sam (Whitelock) will get some time as well. (Muliaina) is making good progress this week and hopefully he'll continue to do so and we're hoping he will be available this week." Henry did not rule out bringing in re-enforcements - possibly from the New Zealand Maori squad. "We're watching the Maori game (against England) on Wednesday and there are a number of players we're obviously very interested in in that team," he said. "So it's probable that they could come from there."